Real Bread – is flour, water and salt really poetry, science, history – or politics? To mark the start of “Real Bread Week” (23rd Feb – 3rd Mar 2019), I did everything in my power to pass on the ‘sourdough bug’ to my 10 year old niece Olivia. Olivia creates her levain – starter, plus a small amount of flour & water. I’m not sure whether sourdough baking is more poetry or science – looking after the starter culture; autolysing the dough; the rhythms of the stretch & fold in the bulk fermentation (less aggression than a knead); the shaping; the proving; the scoring; and the eventual bake at 240 degrees with steam. Olivia takes her levain, then adds a huge amount of flour and water, mixes to create the dough which she leaves to autolyse. Or whether it is more history (the ancestry of your starter culture; and all those ancient organic grains – einkorn; emmer; khorasan), or more about ‘living in the now‘ (the texture; the smell; keeping to time – and of course, the taste)? Olivia with her finished sourdough bake – in her ‘I Am Real Bread’ limited edition ‘Real Bread Week’ apron. All I know is that it puts a smile on my face – and a loaf to pass on to a friend, neighbour or stranger. In that respect, and its total integrity as opposed to everything else you see going on in the formal structures of representative democracy, sourdough – and ‘Real Bread’ is one of the most political things I get my hands on right now! Me in a ‘Real Bread Week’ special edition t-shirt as Real Bread Week kicks off. Thank you for the continuing inspiration, with flair and style to Bake with Jack; Vanessa Kimbell (and her Sourdough Club & Sourdough School); Guildford Sourdough Club; The Wee Baker and so many more. Do look each of them up on Instagram – and Jack has a great YouTube channel. You can find where I got the original recipe I used for sourdough starter here, and the recipe for the actual loaves here – both from Kitchn. The two main books I always recommend are Emmanuel Hadjiandreou’s “How To Make Sourdough“, and Vanessa Kimbell’s “The Sourdough School.” The book by Sarah Owens, “Sourdough: Recipes for Rustic Fermented Breads, Sweets, Savouries and More” explores a vast array of ingredients, and is beautifully laid out too. The absolute key is to develop yourself a time schedule – draw a chart if it helps. Each batch takes me two days. Once you know your time pattern, it gets a lot easier. And it is nothing more than flour, water and salt. The more you practice, the more you learn – and Bake with Jack’s videos are great for practical tips and answer very specific questions too. Find out more about the Real Bread movement here. The floury corner of my kitchen. As ever, it has been a tough call pulling together my top tracks of the year, but in what has been a difficult year due to deaths in the family, and against the backdrop of stagnant cesspit of national politics, it has been a usefully therapeutic exercise. Top (L-R): Sunflower Bean; Clairo; Jungle; Meldoy’s Echo Chamber; Middle (L-R): Tom DeMac; Trampolene; Gwenno; Scent; Bottom (L-R): Skoot; Peggy Gou; Rhye; Junodream. Junodream – “To The Moon“. When it comes to new music, I must make a personal ‘thank you’ during 2018 to Phil Taggart (BBC Radio 1), Janice Long (BBC Radio Wales), the Late Junction team (BBC Radio 3), Jo Whiley (BBC Radio 2) and Ricky Ross (BBC Radio Scotland/BBC Radio 2) who all continue to provoke and entertain, and signpost me to things I otherwise would not have discovered. The book takes a good wander around the terrain which the subject inhabits, highlighting the various strands which bring their own shades to this particularly vague of topics, and collecting useful contributions. from them all. Stumbled on, but strangely drawn to as if I was in the film ‘Close Encounters of the Third Kind’, this concrete lump is the remnant of an age when gravel was extracted from an area in Hampshire that is now part development, part nature reserve – true ‘borderlands’. I’d always understood that psycogeography was about exploring how a place makes us feel and behave, so getting beyond simple physical, and human geographical subject labels. It’s a lot more than that. The book asserts that psychogeography is neither a political creed (which has mainly been embraced by the Situationalists), nor a literary movement, an ecological fashion, nor a set of ‘New Age’ ideas, or avant-garde practices, but instead, it charts an ever-moving definition which draws on all for sources of inspiration. One of the most literal definitions to which the book repeatedly returns is that ‘point where psychology and geography intersect‘, and the practice of walking, through which to experience it is central too, although more recent writers have expanded this to included other forms of transportation, such as train, bus, car and plane. 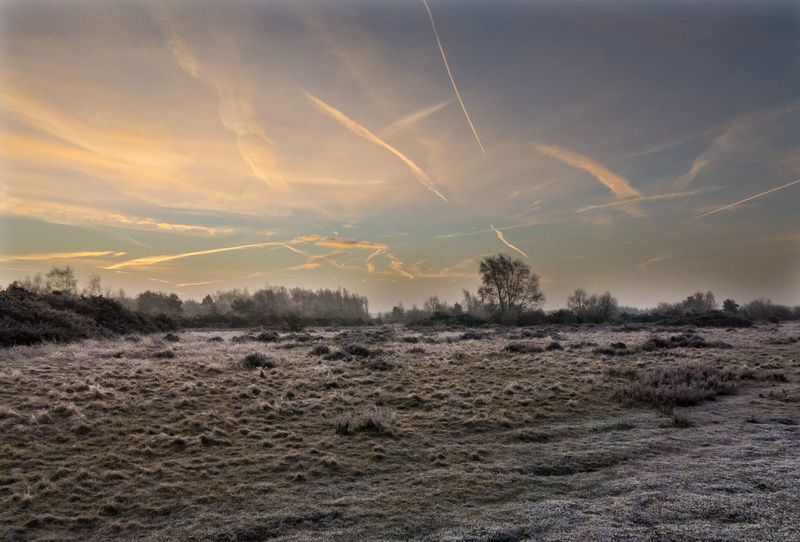 Perfect for an aimless walk, this disused runway on Yateley Common was originally an RAF base in WWII, and in the 1970s, played host to a Bob Dylan concert with a crowd of over 200,000 people. I suppose an aspect which has always appealed to me is that where there is also a preoccupation with drawing on the past, and what it has to tell us through the lived topology of place. For some people, this goes as far as to include the occult, and the New Age too. I have always been interested in how two very similar, but neighbouring places can have very different personalities, and how such effects can endure over time. A friend of mine more aptly call’s this a place’s ‘soul’. 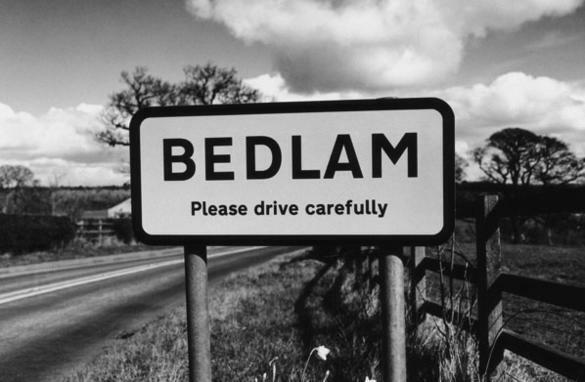 The book starts to introduce how this is indeed an aspect of psychogeography. A walk when on holiday in the ‘picturesque’ East Sussex town of Rye does not mean heading for the usual destinations for me. You never know what you might find – the history (and hue) of this ‘Private Members Club’ looked interesting. While I wanted to get straight onto the contemporary and existential aspects of the practice, I found the historical and literary chapters really helpful, not only in charting its development, but helping to unravel particular characteristics of the practice, and what they can achieve. The book takes us through Daniel Defoe, Robinson Crusoe and a reimaging of the streets of London; William Blake and his visionary, transformative topography of London; Thomas de Quincey’s dream-like wanders, and metaphorical quests, such as for a ‘North West passage’; Robert Louis Stevenson’s gothic trawls of gruesome, yet entrancing streets of Victorian times; Arthur Machen’s art of wandering, particularly provoked by constantly looking for the unknown; and, Alfred Watkins and the near occult, hypothetical alignment of places or features with a wider geographic, spiritual or religious significance. Turned a corner, and another part of Rye which made me feel, well, it spoke to me on a deeper level. As well as in London, the book spends time in Paris, looking at the idea of the flaneur – and flags up one the huge issues, until recently, with the whole tradition – it’s near exclusion of a female perspective. While here, it touches on the debate over whether the idea is about being an observer, or a participant; spectator or agitator? Loner, or alone in a crowd? Can it be practiced sitting down, from a chair, as mental travel? Solitude is a concept which is something to which I will return. And when it moves on to examine the calls on it by the more avant-garde and the Surrealists, we touch on on the role space, and performance play in its discharge, and in doing so, I for one am invigorated by how it might wake us up to what our current political, economic and environment balance sheets are doing to our daily inter-actions with the places we inhabit, often in more of a sleep-walk, than anything than a real relationship of any kind with our surrounds. Stationery for a long time in Rye! Undirected ambling. ?Dreamlike wandering? Detached observation? Committed and involved practice? Drifting purposefully? Purposeful gait? Pedestrianised stalking? Deep typology (as coined by Nick Papadimitrou)? Eavesdropping? The book provides so many ways of looking at the the practice. Self is one of a number of contemporary authors who have embraced psychogeography in their writing, both fiction, and non-fiction. Iain Sinclair has done much to re-examine the practice, for examine, using the idea of the fugueur (who is fleeing, escaping) to chart things, as well as the flaneur. He has also discussed the obsessive charting, documenting, and journaling/storying which can accompany all of this. Some can practice it in a very progressive, reclaiming, power challenging fashion; others can interpret it as an extremely conservative, affirming, identity expressive form. There is a wide spectrum, as with everything. It does what it says on the tin. I love walking somewhere new as often as I can, being provoked by something I shouldn’t have found. This is the perfect introductory book. As most reviews have said, “it does what it says on the tin”, with plenty of accurate references underpinning it. I am fascinated by psychogeography on a personal level. It really speaks to me, and helps me unravel the relationship I have with my town, and county, knowing I have been able to chart stories for generations of my family back past the year 1000, and in my town to the early 1600s. I’m fascinated about the levels of relationship with place, what makes a town different from its neighbour, and how landmarks and developments shape the soul of a place, and intrigued by just what goes on in ‘borderlands‘. Should we be worried by a privatisation and sanitisation of public space making any prospect of free movement by modern day flaneurs nigh on impossible? Feeling #1, in the churchyard of St. Andrew’s, in central Farnham. Feeling #2, nearby in the grounds of Farnham Library in Surrey. A different feeling – more of a centrifugal force, as though the ground was twisting us. Not the calm that I thought the peaceful park would bring. And on a professional level, from an industry that has always been a bit of a ‘jackdaw’, I’m fascinated about what psychogeography can do to help create new practice, or understanding in public relations and communications. If we can unleash more of allowing people to think more about how a place makes them feel, rather than more literal measurements, untangling human and physical geography so that the pedestrian is born again, maybe we will open up a new flank of possibilities? Or maybe I’m clutching at straws. Thankfully, I’ve retired, and I’m free to ponder these things on long walks, rather than having to pitch them as new strategies in boardrooms! I decided to launch a new blog when at the tender age of 45 years, I was medically retired due to my neurological condition of Arnold Chiari Malformation, and related ugly sisters, Occipital Neuralgia and Complex Mixed/Central Sleep Apnoea. It has meant a lot of readjustment, but it has also made me realise that I now have more of a space in my life (and a responsibility) to reflect on the things that are important to me. My previous blog had just become a bit of promotional tool for my previous work role, so the decision to start again seemed natural. Hence, Dutch HQ was born. And so to the ‘header’ strap-line. 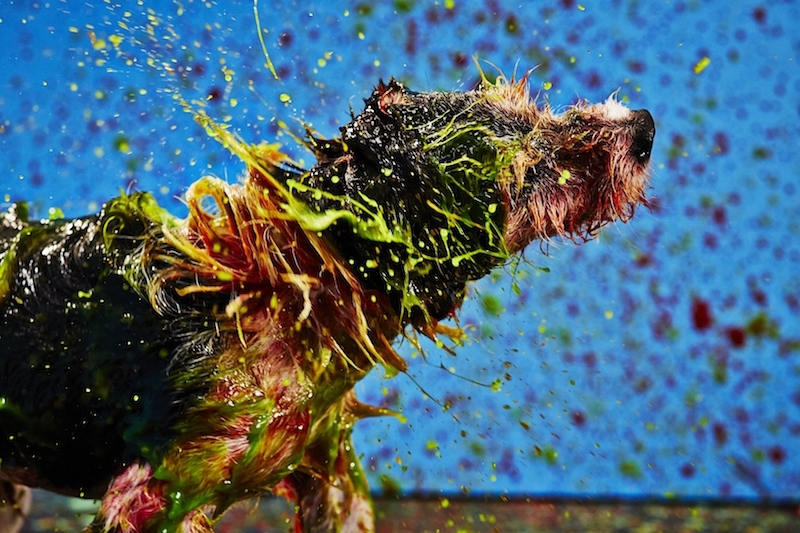 Dogs create amazing paintings by shaking their coats – raising awareness of their plight, and funds for their shelter. “Communication” – because of my time spent working and lecturing in PR and communication, and my fascination with how we manage to interact on a human level, whether that’s anthropological, rhetoric, persuasion or design, for example. “Commonplace” – because, first, I like the spirt of the ‘commonplace‘ books, which gave people a home for their thoughts, notes and jottings long before blogs arrived. Second, I want to give voice to the ‘particular’; those everyday details which we take for granted, which in fifty years time will probably be celebrated as nostalgia. I want to celebrate them now, and in doing so, also give more of a voice to the political side of my character that I feel I often allowed my professional roles to ‘muzzle’. Third, I now live next to a huge area of ‘Common’ land in Hampshire where I grew up, and I love it! Finally, “Confounded“. Again, this has two sides. First, I want at times to be described as “..that confounded…”, or “that damned”, because of my actions or positions. But, less ambitiously, “Confounded” because I am bewildered, confused or astounded by much of what I see, and want to reflect on it. So, whether it’s public relations, or education; politics, radio or ‘listening’ more broadly; or music, family history, Leeds United, botanical prints, sourdough baking, Slinkachu photography, Ben Whishaw – and much more besides in my wider personal space, welcome to the new home of Dutch HQ. Whether it’s about where power lies, or why buses are a disgrace outside of London; how organisations work most effectively with their customers or supporters, or why a particular colour works best in a campaign, I want to be there. If it is a mess, so be it. That is life. If I can do something about teasing out the individual threads, so that the mess becomes a bit more fathomable, and we become more motivated to clear it up, so much to the good.